Robert C. "Bob" Kolesar (April 5, 1921 – January 13, 2004) was an American football player and medical doctor. He played at the guard position for the University of Michigan from 1940 to 1942 and for the Cleveland Browns in 1946 after a stint in the U.S. Army during World War II. While playing at Michigan, he was part of a line that was known as the "Seven Oak Posts". Kolesar retired from professional football after one season to pursue a medical career, and later established a practice in Saginaw, Michigan. He died in 2004. A native of Cleveland, Ohio, Kolesar attended John Adams High School before graduating and enrolling at the University of Michigan. Michigan's 1942 line had assumed the nickname, the "Seven Oak Posts", and started the same men each week; the only rest the seven enjoyed coming in the second half of the Harvard game. Soon the two platoon era at Michigan and everywhere else would doom demonstrations of this kind of gridiron endurance. But these Wolverines offered many a thrill. Kolesar was a medical student at Michigan, and a news story about him in October 1942 ran under the headline, "A Maulin' Medical Man." At the end of the 1942 season, Kolesar and Michigan quarterback George Ceithaml were invited to compete in the annual Blue and Gray Game at Montgomery, Alabama. In 1943, Kolesar enlisted in the U.S. Army, but remained at the University of Michigan as a medical student. Although he had an additional year of eligibility under the wartime NCAA rules, the Army ruled that its trainees were too busy to play college football. He was drafted by the Detroit Lions in the 12th round of the 1943 NFL Draft with the 101st overall pick. 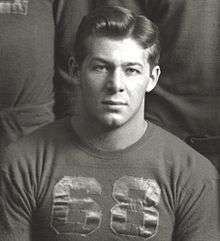 After being ruled ineligible for college football, Kolesar signed with the Detroit Lions in September 1943. Kolesar said at the time that he would continue his medical studies while playing for the Lions; he said he would be able to practice three days a week and would be available for weekend games. Kolesar, however, did not appear in any games for the Lions in the 1943 NFL season, and in August 1944 he was selected to play against the Chicago Bears in the College All-Star Game, a now-defunct matchup between the NFL champions and the country's best college players. In February 1946, after completing his military service, Kolesar signed to play with Paul Brown's newly organized Cleveland Browns football team. Kolesar played for the Browns in their 1946 inaugural season in the All-America Football Conference. The team won the AAFC championship that year. After one season with the Browns, Kolesar elected to return to medical school at the University of Michigan. He later went into private practice as a physician in Saginaw, Michigan. Kolesar's son, Thomas, played football at Princeton University. Kolesar died in 2004 at age 82 while living in Midland, Michigan. ↑ "Murtryn, Kolesar and Cliff Lewis Are Signed by Cleveland Browns". Cleveland Plain Dealer. February 19, 1946. p. 18. ↑ "1940 Football Team". University of Michigan, Bentley Historical Library. Archived from the original on October 6, 2012. Retrieved August 25, 2012. ↑ "1941 Football Team". University of Michigan, Bentley Historical Library. Archived from the original on October 6, 2012. Retrieved August 25, 2012. ↑ "1942 Football Team". University of Michigan, Bentley Historical Library. Archived from the original on October 6, 2012. Retrieved August 25, 2012. ↑ "Wolverine, Ohio Lines Are Rugged". St. Petersburg Times. Columbus, Ohio. Associated Press. November 21, 1942. p. 14. Retrieved August 25, 2012. ↑ Jim Cnockaert (2004). Michigan: where have you gone?. Sports Publishing LLC. p. 78. ISBN 978-1-58261-771-8. ↑ "Two Great Lines Collide Saturday". The Palm Beach Post. November 11, 1942. Retrieved August 25, 2012. ↑ "Wolverines Smear 'Otto Graham' in Practice". Ludington Daily News. October 14, 1942. Retrieved August 25, 2012. Michigan's 'Seven Oak Posts' are intact for another game. The same that has played almost without relief through hard games with Great Lakes, Michigan State and Iowa Cadets will carry the Wolverines into Big Ten competition. ↑ "Line Play May Cop Headlight At Columbus". The Gallup Independent. November 20, 1942. Called Seven Oak Posts, Michigan's line of center Mervin Pregulman, guards Bob Kolesar and Julius Franks, tackles Al Wistert and Bill Pritula ... and ends Phil Sharpe and Elmer Madar got the 'oak post' reputation because few substitutions are used. ↑ Lyle E. Nelson (May 1998). "Crisler's '42 Ironmen". College Football Historical Society. Archived from the original (PDF) on October 6, 2012. Retrieved August 25, 2012. ↑ "A Maulin' Medical Man". The News-Palladium. October 29, 1942. ↑ "A Maulin' Medical Man". Adrian Daily Telegram. October 30, 1942. ↑ "Receive Invitation". The News-Palladium. November 18, 1942. ↑ "Slightly Muddled". The Palm Beach Post. September 5, 1943. Retrieved August 25, 2012. 1 2 "Bob Kolesar profile". Pro Football Reference. Archived from the original on October 6, 2012. Retrieved August 25, 2012. ↑ "Bob Kolesar Signs With Detroit Lions". Bradford Era. September 3, 1943. ↑ "Complete List of Star Team". The Milwaukee Journal. August 10, 1944. Retrieved August 25, 2012. ↑ "Cleveland Browns Sign Star Passer". Sandusky Register Star News. February 19, 1946. ↑ Piascik 2007, p. 64. ↑ Stanley Grosshandler, M.D. "PRO FOOTBALL'S DOCTOR ALUMNI". Coffin Corner (condensed from Rx Sports and Travel, Sept./Oct. 1970). Archived from the original (PDF) on October 6, 2012. Retrieved August 25, 2012. ↑ "Tom Kolesar". Sports-Reference.com. Archived from the original on October 6, 2012. Retrieved August 25, 2012. ↑ "Social Security Death Index". Familysearch.org. Archived from the original on October 6, 2012. Retrieved October 6, 2012. Piascik, Andy (2007). The Best Show in Football: The 1946–1955 Cleveland Browns. Lanham, MD: Taylor Trade Publishing. ISBN 978-1-58979-571-6.